Brother John said they received a very fine welcome presented by the Apostolic Faith Secondary School children, who were all dressed nicely in matching blue and white uniforms. After they sang, three of the young girls presented Sister Rodica with a beautiful bouquet of flowers. The children then led the way to the site of the first activity, which was a groundbreaking ceremony for a cafeteria. Brother Bayo and Brother John lifted the first shovelful of dirt while praying, and then the whole group went to each of the four corners of the outlined foundation and prayed, dedicating the future building for God’s use and glory. Next, everyone proceeded to a recently completed guest house for a ribbon-cutting ceremony and tour of the building before moving into the church sanctuary for a formal dedication service. An organ prelude, followed by a selection from the choir, opened the service. 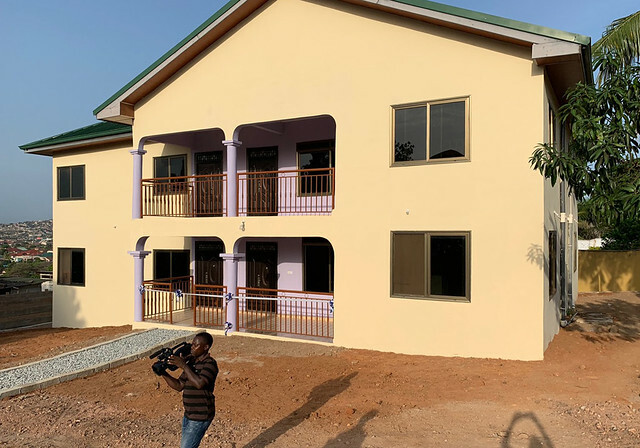 It continued with prayer and a brief history of the guest house, which will serve a number of functions, including as housing during camp meetings. Before the closing prayer, the congregation sang “To God Be the Glory,” and then many gathered around the altars and enjoyed a good time of prayer. On Tuesday, the team went to the Ada area of Accra on the southeast coast of Ghana. With twenty churches, it has been the most fruitful of the Ghana work. They first visited the Sege church, which is the main branch in Ada. There were many children running around and they learned that most of them attend our Sunday school program. Next they went to the Ayisah church, which is under construction but near completion. It is expected to become a hub for outreach into the nearby communities very soon. The pastor indicated that the congregation has already established a Sunday school center in a nearby location. Lastly, they visited the Kasseh-Ada church. It is one of the nicer buildings in town. In fact, Brother John commented that all three churches stand out as being very well done. At each location a short service was held, which included congregational singing, some remarks, and prayer. In addition, each branch gave a history of the work and reported on the current status of church projects. There was also time allotted afterward for fellowship and taking photos. Upon leaving, Brother John said the team was very encouraged by the work that is expanding in the Ada area.